Summer is here and I am spending a lot of time in the kitchen cooking. Everything is so fresh and tasting its best. One of my favorite obsessions for the summer are pineapples. I have been eating pineapples with everything – Everything!!!! Today, I figured I would share a quick post on one of my easy lunch meals that are sure to satisfy your summer taste buds but also keep you fit and healthy. I cut up fresh watermelon and pineapples. Once cut up I added cheese (feta, goat, any of your favorite or omit) with lime juice and mixed everything together. 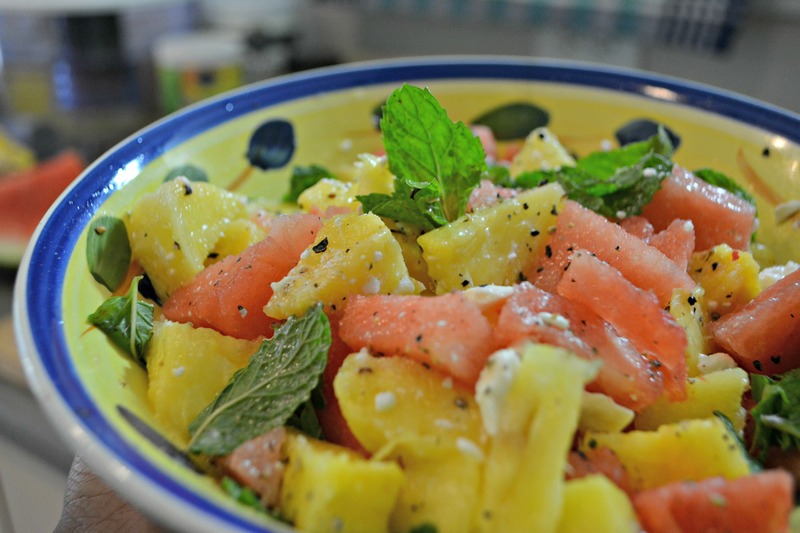 You can also garnish with mint and even add a little bit of cracked pepper for a kick. Cheese is a great vegetarian option for post-workout snack or with a nice healthy sandwich. With natural ingredients and up to 8 grams of protein per serving, you can ensure you are having enough protein in your daily diet. Protein is one of the building blocks of hair. If you don’t get enough, your hair can and will often grow slower and could possibly be much weaker. If you are a cheesehead like myself, the folks at Sargento are offering you a free subscription to Women’s Health Magazine. It’s simple and doesn’t cost you anything out the ordinary. If you are like me, I normally buy two types of cheese. If you are, then hold on to those recipes because any two qualifying Sargento snack products will allow for you to get a one-year subscription to Women’s Health Magazine totally free. As a Women’s Health Action Hero (#whactionhero), I get a chance to try and partner with various companies. I was given a complimentary coupon; however, this blog post is not sponsored. As always, all opinions are my own.